TOMS Shoes is an American footwear company that is based in Santa Monica, California, which also operates a non-profit subsidiary,Friends of TOMS. The company was founded in 2006 by Blake Mycoskie, an entrepeneur from Arlington, Texas. The company designs and sells lightweight shoes based on the Argentine alpargata design. With every pair sold, TOMS donates a new pair of shoes to a child in need. Founder Blake Mycoskie attended James Martin High School in Arlington, Texas, and St. Stephen's Episcopal School in Austin, Texas, then did undergraduate work at Southern Methodist University in Dallas, Texas. While competing on the second season of The Amazing Race with his sister, Mycoskie visited Argentina. He returned there on vacation in January 2006 and had the idea to develop a shoe company where for every pair sold, a new pair would be donated to a child in need of shoes. Blake once said of his revelation, "I was sitting on a farm pondering life, and it occurred to me, 'I'm going to start a shoe company, and for every pair that we sell, I'll give a pair to someone who needs them'"Mycoskie took to wearing the local alpargata shoes. After Mycoskie noticed the numerous children without shoes in the poorer villages, he returned to the United States and sold his online driver education company to self-finance the shoe company. Alpargata shoes have been worn by Argentina farmers for 100 years and were the inspiration for the classic style of TOMS. These canvas or cotton fabric shoes are now manufactured in many styles including a Wrap Boot, Stitchouts, Cordones, and Botas. The sole is constructed of rubber. TOMS offers several vegan styles as well. The company name is derived from the word "tomorrow", and evolved from the original concept, "Shoes for Tomorrow Project". SEND YOUR PHOTOS OF YOU AND YOUR FLAG AND JOIN OTHERS FROM AROUND THE WORLD IN SUPPORTING THE ONE FOR ONE MOVEMENT. You can also join TOMS shoes in FACEBOOK, and share your flag photos. Hmp! kala ko sabay tayo? :-( Pft! is this self portrait? its great! i really like the way the company work with the donations, sounds good. Nice collection and great way to advertise. This is a really cool idea, I wish more companies would do this. I like the Wrap Boots, they remind me of Tabi shoes. This is an awesome collage. :) And I quite like the idea behind it. june 26, >>> also my DADS birthday, and GAY PRIDE DAY! Neat photos! AND it's a great cause that that company stands for! I like your expressions. 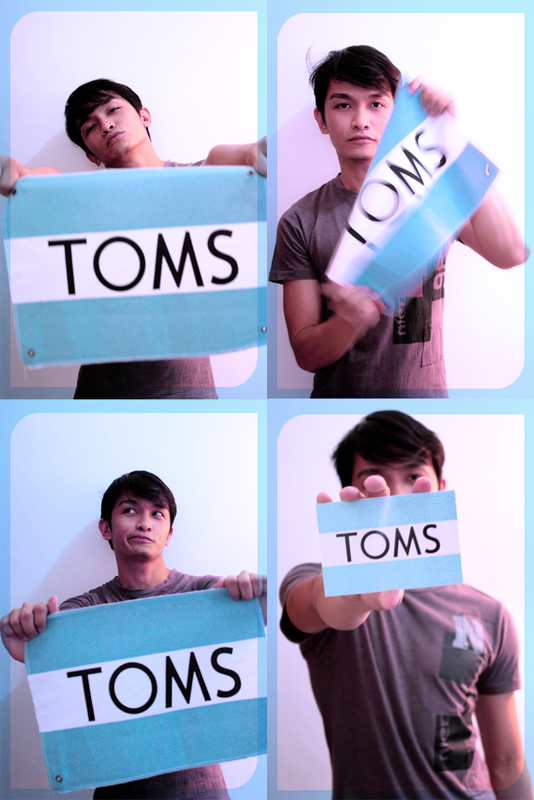 :) TOMS is a really neat company. PS. Your new profile pic is wicked! Love it! haha you and your cute faces..I love it. this is awesome!!!! your faces are so great. hahah ohh this is a favorite for sure. :)) nice work. I LOVE TOMS!!! i wore a pair today! they're awesome!